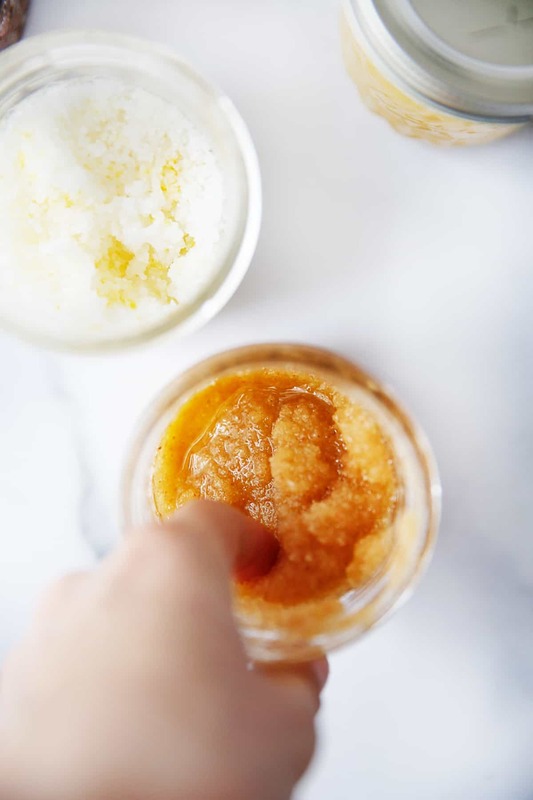 We’re deep diving into How to Make Body Scrub and giving you a few options so you can customize your DIY sugar scrub or salt scrub just how you want it! 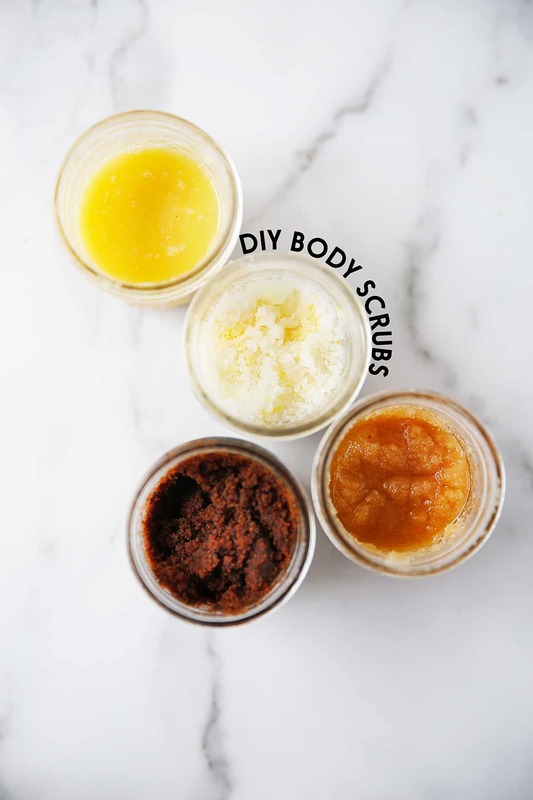 These DIY exfoliating body scrubs take ingredients you likely already have in your kitchen and turns them into a delicious scented scrub that leaves your skin moisturized and smooth, while saving you tons of money by making it at home! The LCK team has been using these DIY scrub for a few weeks now and have been loving it. Not only does it smell AMAZING, but it leaves your skin feeling rejuvinated and moisturized. We love a good deep exfoliation, especially as spring is around the corner and the winter skin is coming in strong! We were in love with our Chocolate Coconut Body Scrub during the holiday season, so we wanted to expand! 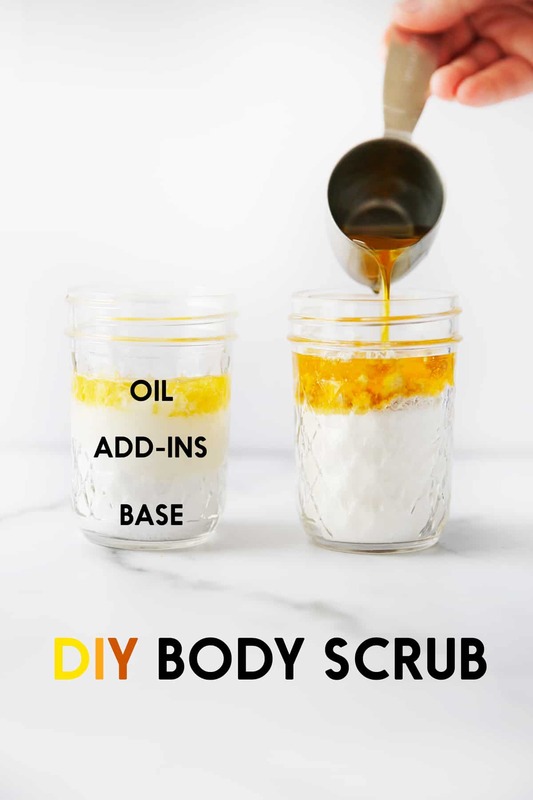 Making a body scrub at home is so simple and we’re going to give you the details on how to make body scrub using all natural ingredients, many of which can be found inside your pantry right now. You can customize them based off of your skin needs and use up to a few times a week! A sugar scrub or salt scrub, also known as an exfoliator, is a purchased or homemade product that helps the skin rid the body of dead skin cells that then reveals healthy, glowing skin. While our body naturally sheds dead skin cells, as we age this process slows down and the dead skin can get backed up causing pores to get clogged, and making skin dry, rough, dull and spotty. Your other products will work better since exfoliating your face eliminates the dead skin on top, it lets your cleanser, moisturizer and other products penetrate more deeply and work better. Unclog pores from dirt, blackheads, and other surface impurities so that new, healthy skin may flourish! Exfoliating helps skin turn over its top dermal layer more often, so you can address a multitude of problems such as dryness and flakiness. A lot of commercially produce scrubs and exfoliators include common household ingredients like salt and sugar and oatmeal, but also contain a lot of other ingredients that may or may not be safe for your body. If you already own a body scrub, or have used one in the past you can check it’s safety from this website here. 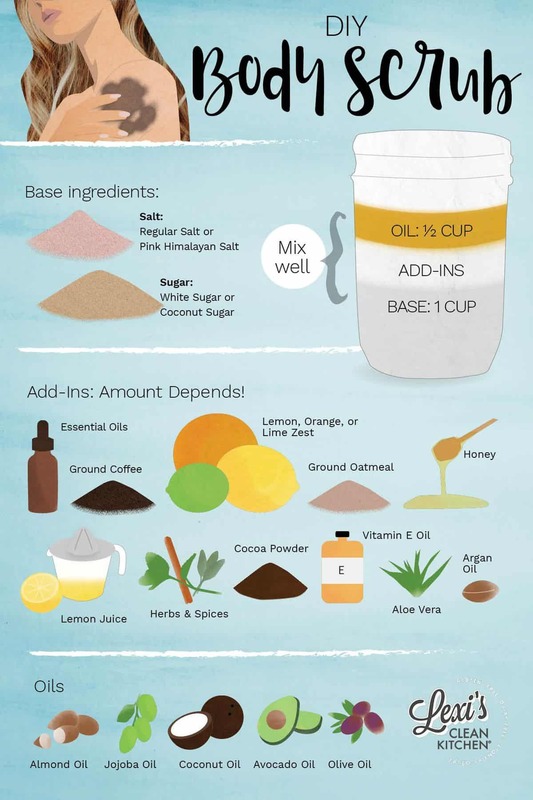 We love the idea of using household ingredients that can exfoliate and moisturize your skin naturally. Plus it’s so much more economical! Start with a base ingredient, or the main exfoliant, and then add in your oil, followed by a few fun add-in options! You can choose between sugar or salt. There are options below for how vigorous you want the exfoliation process to be. Brown Sugar: This is a a very soft exfoliant and as a bonus adds moisture. Coconut Sugar: This is a larger grain of sugar and is a rougher moisturizer. If using this, depending on your add-in you may need to use a bit more of the carrier oil (see below). Kosher Salt, or other large crystal of salt: This is a rougher exfoliator, and is particularly good with lemon. Pink Himalayan Sea Salt: This is the salt we keep around for cooking. It is a finer salt, so a more gentle exfoliant while also having the added benefit of the minerals it naturally contains. These oils or carrier oils help the body scrub apply smoothly and helps moisturize the skin. You can use one of these or do a combination. Almond Oil: This is high in Vitamin E, can protect your skin from harmful UV radiation, and easily penetrates the skin which can help clean out your pores. Jojoba Oil: This oil is similar to the oil naturally found on your skin. It absorbs fairly quickly. Coconut Oil: This oil is an amazing moisturizer and has natural antibacterial properties. Avocado Oil: This is high in Vitamins A, D, and E and can help sooth inflammation. Olive Oil: Commonly found in our kitchens! It is heavier and absorbs slower on the skin. Be sure to use the best possible olive oil you can find (pure/cold pressed/organic). Some of these have specific benefits for your skin while others simply add a pleasant scent that can help brighten your day. How to use them: Soften your skinin a warm shower for a few minutes, cleanse your body if desired, and then grab a dollop of the body scrub and gently scrub in a circular motion on clean, rough skin. Rinse completely. Moisturize afterwards! We recommend about once a week, but you can go up to 2-3 times a week to tackle really dry and rough skin. Yes, and some skin is more sensitive than others. Aggressive exfoliation can lead to irritated and red skin. We recommend exfoliating 1-3 times a week! You can tweak your body scrub depending on how you you want it to feel and smell. Don't bring glassware into the shower. A reader wrote to us and shared a story of bring a glass jar in the shower and accidentally dropping it and cutting herself. So we wanted to spell this out that for safety reasons if you are using a glass jar keep it out of the shower. Or use a plastic container. Want to make body scrubs as a gift? Click here for the page of labels where you can hand write in what type you made! Nicely presented…thank you! I am excited to make a scrub today. Is there a scrub that is ok to use every day? I work in the garden without gloves mostly and need it! But of course I want something on the gentle side. I was thinking of using a super fine sugar to help with that…what do you think? The best way to know is to experiment with your own skin. Start with every other day and see how that feels for you. I’d suggest starting with brown sugar as it’s own the milder side. If your skin feels good with everyday other day try upping it to everyday and going from there. You’ll know if it is irritating your skin as it will feel irritated. I would only suggest trying with hands though.